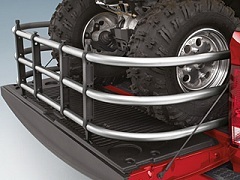 For those looking for truck bed accessories like this, here is a look at the best one. One of the best items you can buy when hauling a canoe or kayak is the Uriah Products Truck Bed Extender. This is an excellent addition to your truck as it adds an extra four feet of length to your bed. Best of all, it’s universal as it fits any standard hitch and it can handle any number of hauling jobs including lumber, canoe or ladders. Additionally, Uriah designed these with you in mind. The angled shaft support provides great stability to your items during transport, meaning it will help reduce vertical swaying. Further, with multiple tie downs and end supports, you have a variety of ways of securing your items. The truck bed extender also comes with safety items like reflective tape and a red flag to alert other drivers. When reviewing the item the only drawback I came across was the price as this model is expensive. Bass Pro Shops currently has it on sale for $119.99. When taking all of these factors into account, it’s easy to see this is the best truck bed extender for those looking to haul longer items like a kayak. The design is outstanding as it provides multiple supports and makes it easy for you to secure your items. There are many safety features included in the kit, which helps alert other drivers on the road especially at night and the durable construction means you’ll be able to use this on many trips. Though the price might be a sticking point for some, when you combine all of these factors this is easily the best item available. If you are interested in purchasing one, you can stop by your local sporting goods store or go to online retailers like Amazon. There you can also find other accessories for your ride like truck bed liners.